Bring your own sticky mat or purchase one from the studio. Bring water and a towel for more vigorous classes. 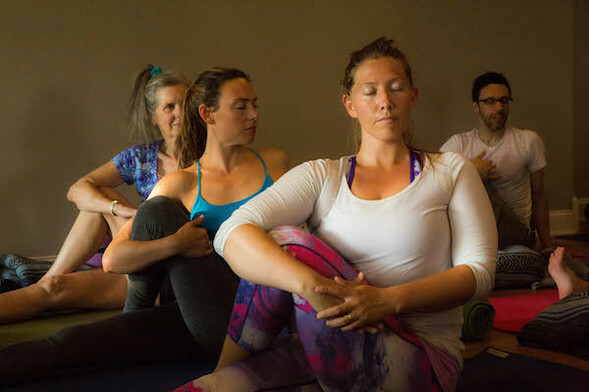 Good Ground Yoga, in the heart of Hampton Bays, New York, is a vibrant, creative center where people gather to embrace the spirit of yoga and holistic healing. They welcome students from all walks of life – from first time students to seasoned practitioners. Most of their classes are either Forrest Yoga classes or Forrest Inspired classes (our signature GGY Flow). Created by Ana Forrest over 30 years ago, Forrest Yoga is a practice designed to free up physical and emotional blocks in the body. In their classes you will learn how to build strength safely, work with injuries, and connect more fully to your breath.